Blizzplanet | Hearthstone » Hearthstone Patch Notes – 1.0.0.4944 – All That Glitters! Hearthstone Patch Notes – 1.0.0.4944 – All That Glitters! New Patch is out! Reconnect Feature is also included! The latest Hearthstone patch is coming! With this patch, we’re fixing a ton of bugs, adding some extra awesome Ranked Play rewards, making a couple minor adjustments to card balance and . . . well, there’s a lot of stuff here! Let’s tackle this big patch together, feature by feature, shall we? We first announced our plans for Ranked Play rewards at BlizzCon during our Fireside Chat panel, and now they’re ready to be unleashed! First off we’ve got the Golden Heroes. 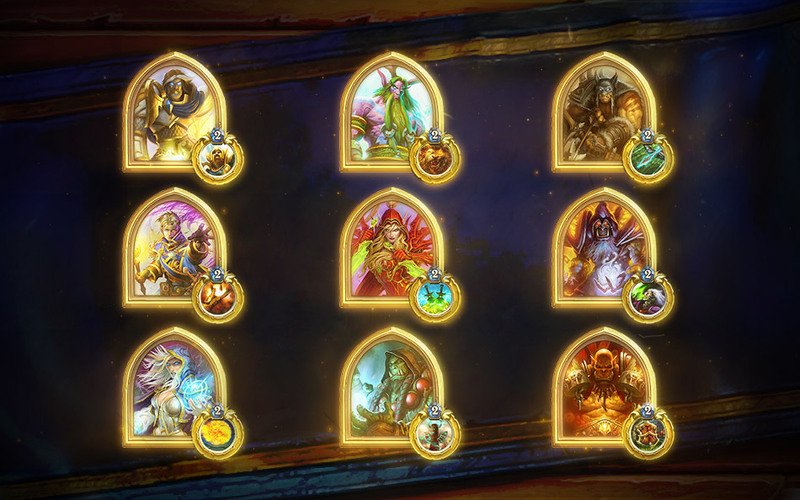 To get a Golden Hero of your very own, all you need to do is win 500 Ranked Play games with any given Hero. After you hit 500 wins, your experienced Hero will gain a gold border, animate, and gain a golden animated Hero Power. Your opponent will be able to see your Golden Hero as well! Impress your friends and opponents alike. Check out the awesome animations on Jaina, Garrosh, and Thrall in this video! The next Ranked Play reward is the extra fancy alternate card back! Participating in each official Ranked Play season will offer a new card back that you’ll get at the end of each season. Card backs replace the default artwork on the reverse side of your decks. The game interface will allow you to easily swap between any card back you’ve added to your collection. More information about the first official Ranked Play season and its card back rewards will be announced at a later time. We’ll be making an additional change to Ranked Play as well, so we can ensure a more fun experience for everyone as we transition from season to season. Many players have felt like the start of each Ranked Play season was difficult since rankings were reset for all players, regardless of how far they progressed that season. With this patch, you’ll receive bonus stars at the start of each season based on your performance from the previous season. This way, players that have progressed far into any given Ranked Play season will not be challenging those potentially new to the game or stomping all over players who are trying Ranked Play for the first time. You’ll receive one bonus star for each rank you achieved in the previous season. For example, if you attained Legend, Innkeeper (Rank 1), or Black Knight (Rank 2) rank in any given season, at the start of the next season you would start off at Questing Adventurer (Rank 16) rather than Angry Chicken (Rank 25). 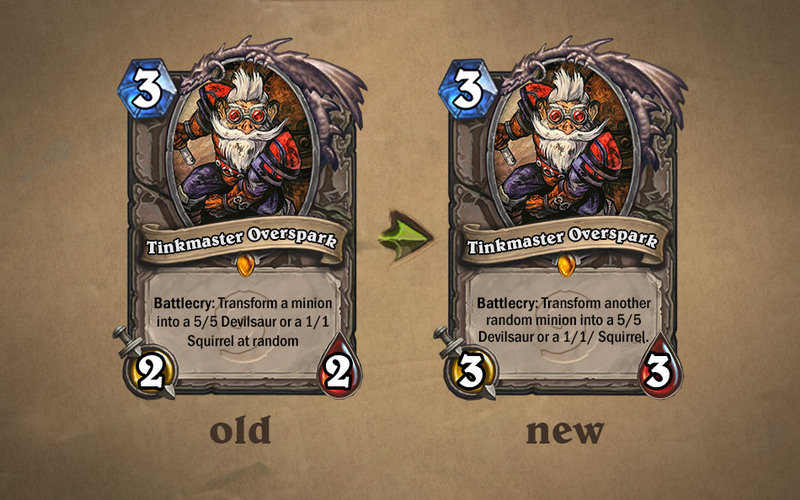 In order to ensure a fun and balanced game for everyone, we’ll be making changes to two cards in this patch: Tinkmaster Overspark and Nat Pagle. 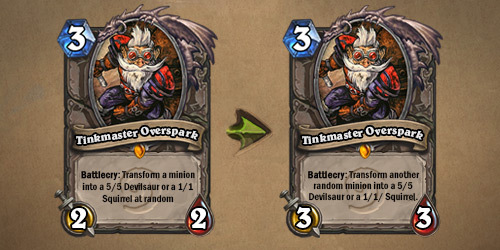 Tinkmaster Overspark is now a 3/3 (up from 2/2) and now reads: Battlecry: Transform another random minion into a 5/5 Devilsaur or a 1/1 Squirrel. Tinkmaster Overspark is a neutral card that silences and often shrinks big creatures. This reduces the amount of big, fun creatures in the environment. We think this change will increase the amount fun creatures in the environment, and bring him more in-line with his cost and overall power. Tinkmaster should still show up in certain types of decks, but will no longer be appearing in every high level deck. 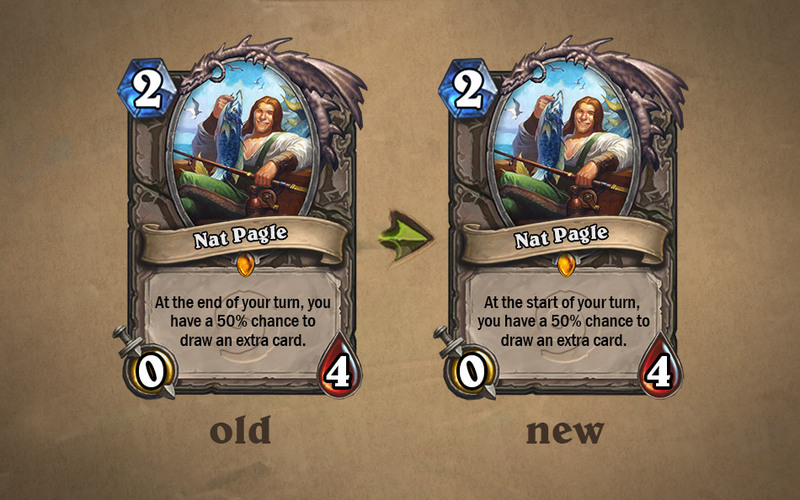 Nat Pagle now reads: At the start of your turn, you have a 50% chance to draw an extra card. 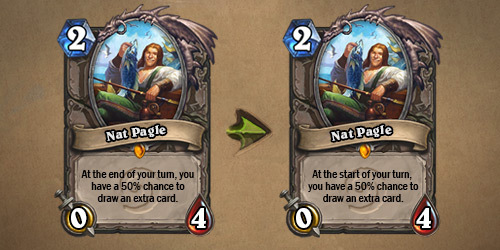 Nat Pagle will now draw a card at the start of your turn rather than at the end. Nat had too much draw power for a card that is fairly hard to counter so early in the game, making it almost an auto-include for many decks. This change reduces the power of the card and gives players more time to counter the card before it starts. Any changes made from here on out will be because we deem them absolutely necessary. A reconnect feature has been added to Hearthstone! Whether you’re in the middle of a heated match in Ranked or Casual Play or racking up the wins in the Arena, our reconnect feature will allow you to try to seamlessly get back into your game in progress. If you’re disconnected from a game, the reconnect feature will give you 60 seconds to re-log into Hearthstone to keep the action going. In order to maintain the fast pace of the game for both you and your opponent, if one of you happens to disconnect mid-match, the game will continue as if either of you were still playing. Try not to be gone too long, or that turn timer may be sizzling down when you get back! Speaking of staying connected, you can now play Hearthstone in other regions across the world! Whether you prefer to duel in the Americas, Europe, or Asia, you can swap your region with just a couple of clicks in the Battle.net Desktop App. 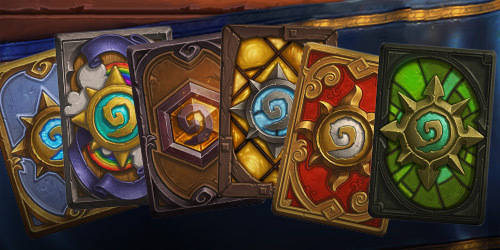 Keep in mind that your Hearthstone collections, friends, and progress are unique per region and won’t transfer over. Thanks to your feedback and continued efforts in reporting bugs in the Hearthstone beta, we’ve been able to tackle many of the issues players have been experiencing. We have addressed all known circumstances and issues that result in minions swapping places on the board and cards overlapping in hand. These bugs were a result of many factors, and both were particularly challenging to address. We appreciate your patience as we worked diligently on resolving these issues. You can see additional bug fixes in the patch notes below! From all of us on the Hearthstone team, thank you so much for offering feedback, reporting bugs, testing our Play modes, testing balance, and helping us evolve the game into something everyone can enjoy. Your feedback is incredibly valuable to us, and we all hope that Hearthstone is a game that you’ll love for years to come. Golden Heroes have been added and now can be unlocked after winning 500 Ranked games with a Hero! 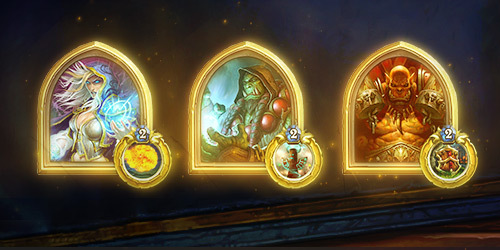 Track your progress on the deck selection screen in Ranked Mode. New card backs have been added. Collect these by doing awesome things such as participating in each Ranked Season! You can now connect to other regions (Americas, Europe, Korea, Taiwan) of Hearthstone regardless of the region that is set on your Battle.net account. Account progress and card collections are saved separately per region. This feature will become available once the patch is live in all regions. The “Players Near Me” feature is now enabled by default. You can disable this feature in the Options Menu. The queue timer now only shows up after you’ve been waiting a while. During each Ranked Season change, players may now start the new season at a rank higher than the default Angry Chicken rank, depending on the rank that was obtained at the end of the previous season. You’ll receive one bonus star for every rank you achieved in the previous season. The Angry Chicken rank now starts with 0 stars, instead of 1. Bawk!? Arena rewards at 10, 11, and 12 wins no longer reward common non-golden cards. Many new card effects have been added. +3 Sparkles/+5 Shinies. Minions who have Taunt and Stealth now have an effect that more clearly indicates that Taunt is temporarily disabled during Stealth. Mass disenchanting now has new and improved graphics. Now you can mass disenchant in style! The UI that pops up when challenging a friend to a duel has been improved. Wow, so challenge. Minions that have been blessed by Blessing of Wisdom now show the trigger “lightning bolt”. Talk about a bright idea! If you disconnect from a game, you now have 60 seconds to try and reconnect and pick up from where you left off. The Expert AI has been sent to Hearthstone training camp and should now be more challenging. If a player’s deck contains all Golden cards, a Golden Coin will compliment your deck if you happen to go second. Unlocking a hero now plays that Hero’s emote. Well met! Secrets can now only activate on your opponent’s turn. Activating your own secrets feels a little strange, but mostly, the ability to do this was preventing us from creating new and powerful secrets that trigger off of events you can easily control (like a minion dying). They end up functioning just like spells, instead of trying to bait your opponent into a bad play. This change keeps secrets working like traps you lay for your opponent, instead of spells that you cast and use on your own turn. Tinkmaster is a neutral card that silences and often shrinks big creatures. This reduces the amount of big, fun creatures in the environment. We think this change will increase the amount fun creatures in the environment, and bring him more in-line with his cost and overall power. Tinkmaster should still show up in certain types of decks, but will no longer be appearing in every high level deck. Water Elemental (Mage) will now properly freeze armored heroes as intended. Ancestral Healing (Shaman) will now always attempt to heal a minion for its full Health regardless of its current Health. The issue where minions randomly swap battle positions with other minions is a result of many factors and issues. All known circumstances and issues that result in minions dancing randomly around have been resolved. Cards now better respect personal space while in a player’s hand. Similar to the minion swapping issue, all known circumstances and issues that result in cards overlapping with other cards in a player’s hand have been resolved. The New Deck button in the Collection Manager no longer stays highlighted if you quickly click the Done and No buttons after selecting a hero. The Hearthstone client will no longer remain in the foreground when you click on another program. You can now select a friend in the friends list by clicking on their medal in Play mode. If you were playing a friendly game when daily quests were granted, you are now correctly notified after the game. The Repair Bot’s healing ability now generates an entry in the game history. Fixed an issue that could cause the buttons to stop working for a short moment when transitioning back to the main hub. Fixed an issue that prevented some accounts from properly receiving friendly challenges. Fixed an issue that prevented some accounts from joining Play, Practice or Friendly games if they have a custom deck in their collection. Fixed an issue where entering a new Arena run while getting a new daily quest can cause the Arena purchase and the back buttons to be unresponsive. Fixed an issue where you will receive a toast stating your friend has just come online if you log into Hearthstone and that friend was already online. Fixed an issue where attempting to create a new deck would cause the game to time out after about a minute. Fixed an issue where backing out of a deck list while its deck tile is animating to the top of the list will cause the deck list buttons to become unresponsive. 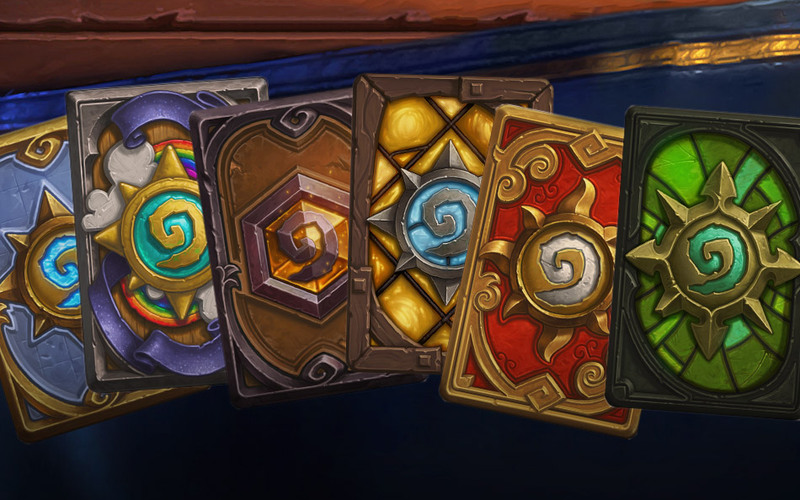 Fixed an issue where cards opened in packs or earned from defeating heroes may not appear in your collection after restarting the client. Fixed an issue where clicking on the Last Played player area in friends list opens up the Add a Friend prompt without automatically filling in the player’s BattleTag. Fixed an issue where the credits can be played while in the Today’s Quests screen. Fixed an issue where the quest Level Up! is completed upon reaching a total level of 10 instead of level 10 on one Hero. Improved many graphical effects and fixed various graphical and game behavior issues. Fixed a number of audio and sound issues. Toggling full screen mode on some resolutions and monitors will no longer cause the window borders to be visible. Fixed a graphical issue that could occur when changing resolutions. Loading into a game will no longer cause graphical issues while on high graphics settings. The system menu bar will no longer display over the client in full screen mode. Using Alt + Tab to switch focus while in full screen mode will no longer cause the dock to appear over the client.